One of three protesters who scaled a 60ft high fracking rig said he only remembered he was afraid of heights when he got up there. Two men and a woman climbed to the top of the site at Kirby Misperton in North Yorkshire in the early hours of Saturday. Three people have since been arrested on suspicion of aggravated trespass and criminal damage. The 29-year-old protester said the three "just went for it, we just ran". The protester, who asked not to be named, added: "I was in front, I just climbed up as fast as I could and pulled the bag up after me. "I got to the top and remembered I was petrified of heights." He said he was arrested on Saturday afternoon when he climbed down from the rig. 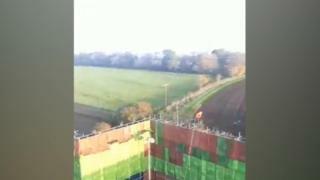 A 28-year-old man and a 21-year-old woman are in custody after they were "helped down safely from the hydraulic rig by police officers working on the site" on Sunday morning, North Yorkshire Police said. The pair were given safety harnesses by police while they remained on top of the platform.